Han Solo Blaster.Includes: One Han Solo Blaster. Dimensions: Approximately 12" x 7". *Batteries and Costume Not Included. Accessories Sold Separately. WARNING!! : The carrying, handling, or brandishing in public of any model that resembles a real weapon may be in violation of the law, may create undue apprehension on the part of law enforcement officers or other persons, and could result in injury to the person handling the model. Keep away from fire.CAUTION!! 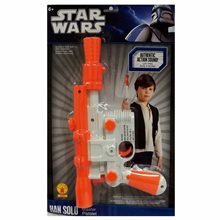 : Not installing batteries in correct position will damage the trigger mechanism.Complete your Han Solo costume with this Han Solo Blaster! Requires 2 "AAA" Batteries. Batteries Not Included. Features authentic action sound! 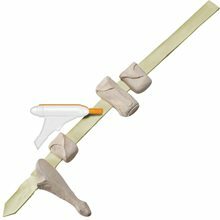 This product is a costume accessory and is not durable enough for battle or other play. Made in China. Darth Vader Red Lightsaber.Includes: One Darth Vader Red Lightsaber. *Batteries, Costume and Other Accessories Not Included. Sold Separately. Darth Vader Lightsaber on! Your child already has his Star Wars costume ready, so complete the look with a lightsaber accessory that's sure to make every dad on the block jealous. And with so many colors and characters to choose from - even Darth Vader - he'll be ready to take on the galaxy one candy bowl at a time! Star Wars Luke Skywalker Lightsaber.Includes: One Luke Skywalker Lightsaber. *Batteries, Costume and Other Accessories Not Included. Sold Separately. 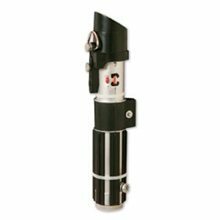 Official Star Wars costume accesory from Rubies Costume Co. Anakin's lightsaber lights up with batteries (not included). Made with injection mold plastic, it has a realistic look and will complete your outfit.Officially Licensed Star Wars costume accesory. Star Wars Qui Gon Jinn Lightsaber.Includes: One Qui Gon Jinn Lightsaber.Dimensions: 12" length, 35 1/4" length extended. *Batteries, Costume and Other Accessories Not Included. Sold Separately.Star Wars Lightsaber Qui-GonStar Wars Lightsaber Qui-Gon.Contains sturdy injection molded plastic with light up telescoping blade. Batteries NOT included.Officially Licensed Star Wars Accessory. 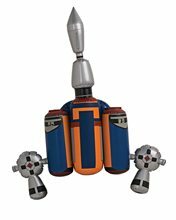 Amidala Blaster Weapon with Holster.Includes: One Amidala Blaster Weapon with Holster. *Batteries, Costume and Other Accessories Not Included. Sold Separately. Fight the Clone Wars! 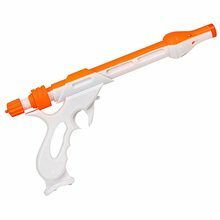 Based on Padme Amidala's blaster, this plastic Star Wars piece makes authentic movie sounds when used. Great for any Padme costume. Requires 2 AA batteries for sounds. 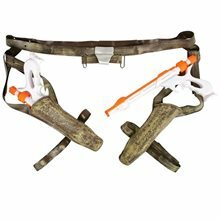 Complete your Star Wars costume with this Amidala Blaster with Holster! 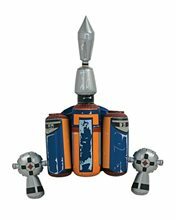 Jango Fett Inflatable Backpack.Includes: One Jango Fett Inflatable Backpack and Repair Patch. Available Size: One Size Fits Most Adults, Teens and Children. *Costume and Accessories Not Included. Sold Separately. Simply blow up this colorful backpack and you have a fantastic Star Wars look. Comes in one standard size. Star Wars Obi Wan Kenobi Lightsaber.Includes: One Obi Wan Kenobi Lightsaber. Dimensions: . *Costume and Accessories Not Included. Sold Separately. Complete the look of your Obi-Wan Kenobi TM Costume with our licensed Obi-Wan Kenobi TM Light saber. It's the perfect addition to complete your costume this Halloween! Officially Licensed Star Wars Accessory.